Earlier this week, we shared our A Nightmare on Elm Street pairing. True to horror form, we couldn’t let Freddy rest without a battle against Jason. 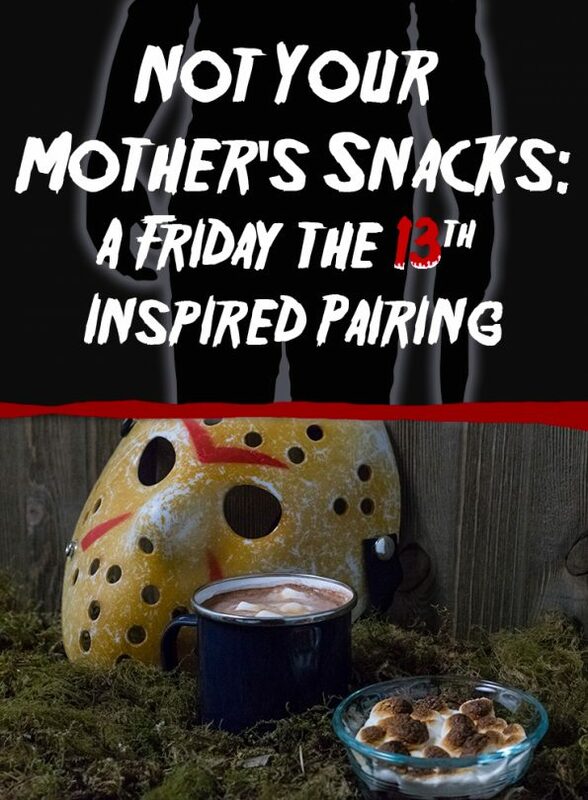 Therefore, we are excited to share with you our Friday the 13th inspired cocktail and snack pairing! It’s sweet versus salty in this battle of epic proportions! 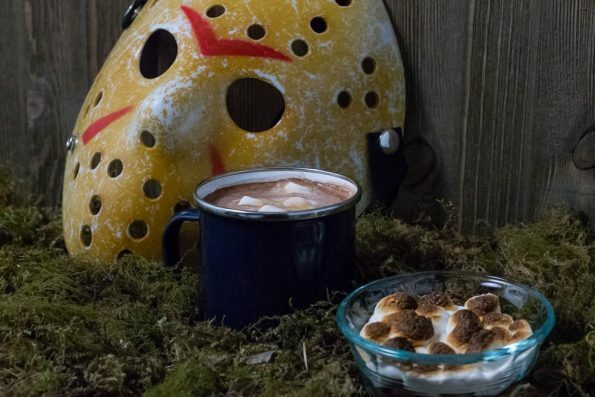 For our Friday the 13th pairing, we were inspired by camp favorites. The idea was a pairing that you might find at Camp Crystal Lake. S’mores and hot cocoa definitely fit the bill there. That being said, these aren’t what Pamela Voorhees would have cooked up. We had received some samples of Brownie Brittle and had been going back an forth about what to make with them. It then dawned on us that they would be a perfect substitute for graham crackers in our S’mores Cup. Churched up hot cocoa was next on the agenda. We decided that marshmallow vodka and bourbon would do the trick there. Next week we will have another slasher themed pairing! Make sure to vote for your favorite, Jason or Freddy! You can do so either in the comments below or using the hash tags #GWEFreddy or #GWEJason! Be sure to visit for more horror and Halloween fun! Add bourbon, vodka, and caramel. Break up Brownie Brittle and fill 6 Pyrex or oven safe ramekins with 1/2. Split Caramel Bits between the 6 cups. Top with remaining Brownie Brittle. Place cups on baking sheet. Cook for 5 minutes (the bits will soften but not fully melt). Return cups to the oven, watching closely. Remove when marshmallows are toasted. *The Geeks received samples of Brownie Brittle for review and decided to use a portion as part of this recipe; in no way did this impact our decision to facilitate this write-up; All opinions are wholly our own. View our Disclosure Policy for more info. Will remember your drink on Halloween or other frightening nights! Sound very tummy warming. Whoa this sounds good…anything with S’mores in it I can get behind! This cocktail looks simply amazing, especially paired with the S’mores Cup! Perfect Halloween treat! Thank you for sharing. Lovely pairing. I will give it a shot.